In the northwest corner of Thessaly, the wide bed of the Pinios River emerges from the mighty canyons of the Eastern Pindus Mountains that plummet abruptly onto the Thassalian plain. Here, in the shadow of the mountains and just beyond the town of Kalampaka, massive gray colored pinnacles rise towards the sky. It is a strange but breathtaking landscape that has been sculpted by wind and water over thousands of years. These smooth, vertical rocks have become a favorite destination for rock climbers who are, perhaps, the only ones today who can truly appreciate the feat of the 9th century hermits who first climbed them to settle in the caves and fissures of the rocks. On Sundays, they clambered down from their cells to celebrate mass in Doupiani and as their numbers increased, the Theotokos of Doupiani was established as the first semi-organized community during the 11th century. By the 14th century, the Byzantine Empire was already on the wane and the monastic communities of the Athos peninsula were increasingly besieged by Turkish pirates. After an encounter with brigands, three monks, Gregory, Moses and Athanasius, left the Monastery of Iviron on the western coast of the peninsula to search for a new home. They had heard of miracles taking place in the land of the great rock forest and on arriving there, settled on top of the rock called Stylos or the Pillar where they built a hesychasterion or wooden hut. Later, Athanasius assembled a small community and constructed a few cells and a chapel in a cave on the nearby Platys Lithos or the Broad Rock. The Serbian Emperor, Symeon Uros provided them with an endowment that allowed them to build the Church of the Transfiguration around 1356 and to expand the monastery with more cells and cloisters. His son, John Uros, retired here as the Monk Ioasaph about 1373 adding to the already sizable endowment enjoyed by the Grand Meteoron, also known as the Monastery of the Transfiguration. Ioasaph assumed authority upon the death of Athanasius in 1383 and he further expanded the monastery and the Church. Meaning suspended in air the name Meteora soon came to encompass the entire rock community of 24 monasteries. There were no steps and the main access to the monasteries was by means of a net that was hitched over a hook and hoisted up by rope and a hand cranked windlass to winch towers overhanging the chasm. Monks descended in the nets or on retractable wooden ladders up to 40m long to the fertile valleys below to grow grapes, corn and potatoes. Each community developed its own resources and by the end of the 14th century, the Grand Meteoron emerged as the dominant community. Its wealth included landed estates, flocks of sheep, and herds of cattle. After Ioasaph died in 1422, Meteora gradually plunged into a period of disorder and decline. Unscrupulous men expropriated the income of the monasteries, Vlach squatters settled in Holy Trinity and Kallistratos and a squint eyed monk named Theodore lived with two women dressed as monks in the Monastery of the Pantocrator. The rock community enjoyed a brief revival of monasticism in the 16th Century under the reign of Suileman the Magnificent who relaxed earlier prohibitions on the building and restoration of Christian churches but lapsed once again into decline. 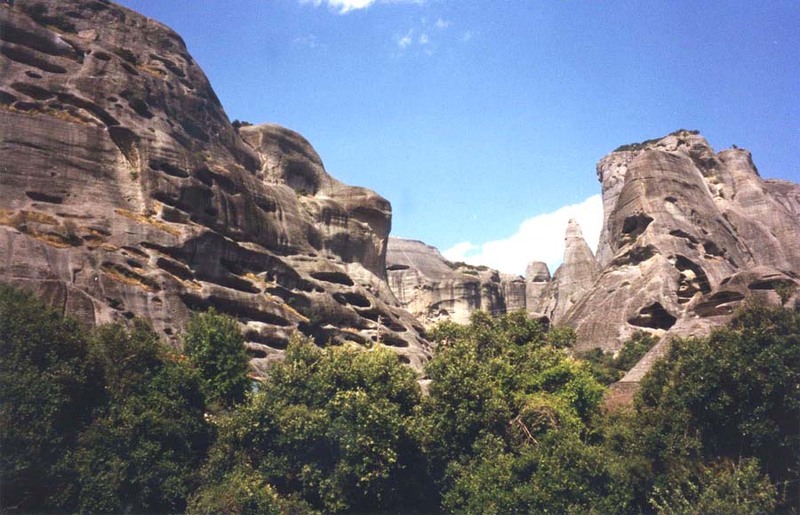 By the 18th century, Meteora had become a refuge center for Greeks escaping the increasingly harsh administration and taxation of the Ottoman overlords as well as a hideout of the klephts, rebel warriors who harassed the Turks and participated in the fight for independence in the 19th century. The German and Italian occupation during World War II saw further looting and destruction of the monasteries. Today, only six monasteries survive as museums. They are sparsely occupied by a few monks and nuns but they offer a rare glimpse of Orthodox monastic life. Best Times to Go: The Monasteries of Meteora may be visited year round but the weather is wet and cool from December to March. Crowds and high season rates are guaranteed from July 1st to October 15th . May and June are the best months for comfortable weather, low season rates and the opportunity to leisurely explore the area. Getting There: Buses to Kalampaka are available from Ioannina, Trikala, Thessaloniki and Athens. It is also possible to take the train from Thessaloniki or Athens with a switch at Larissa. If you are traveling from Athens, take a morning train so that you can enjoy the spectacular scenery as you pass through the mountains between Livadia and Lamia. Clothing/Gear: Appropriate clothing is required to visit the monasteries. Sleeveless clothing and shorts are prohibited. Skirts and shawls are available at the entrance for those who are deemed to be unacceptably dressed (including guys wearing shorts and tanktops). General Information: A visit to the Monasteries of Meteora is highly recommended. Each monastery charges a small admission fee. The nearby towns of Kalampaka and Kastraki have become very touristy with accompanying higher rates than the outlying areas. We suggest combining a trip to Meteora with another destination such as Zagoria or the Halkidiki peninsula. If you do not plan to travel to other areas in northern Greece or if your time is limited, the most efficient way to visit Meteora is to take a bus tour from Athens. You can usually negotiate a good deal with any of the several travel agencies to be found around Syntagma Square. 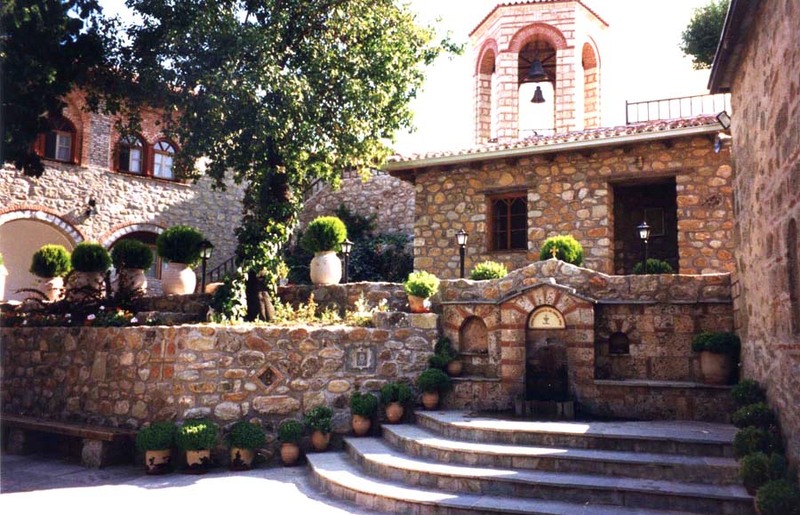 The Greek National Tourist Organization produces a brochure entitled "Greece: Thessalia Meteora" which lists several A, B and C class hotels in Kalampaka as well as their telephone numbers. Unlisted are many D and E class hotels, domatia and campsites. A listing can be obtained from the local Tourist Police located near the bus station (Hatzipetrou 10, Kalampaka Tel: 2432022813, 2432022109). Hotel rooms in the A,B and C classes cost about $50-$100 per night for a double in the high season and about a third less in the low season. Greece: A Lonely Planet Travel Survival Kit by David Willett, Rosemary Hall, Paul Hellander and Kerry Kenihan provides excellent general travel information on Greece. They also provide food and lodging recommendations for small villages like Kastraki. Roumeli: Travels in Northern Greece by Patrick Leigh Fermor is one of the best travel books written about Northern Greece. "The Monasteries of the Air" is a chapter that should be read before visiting Meteora but it is likely that you will want to read the book in its entirety. 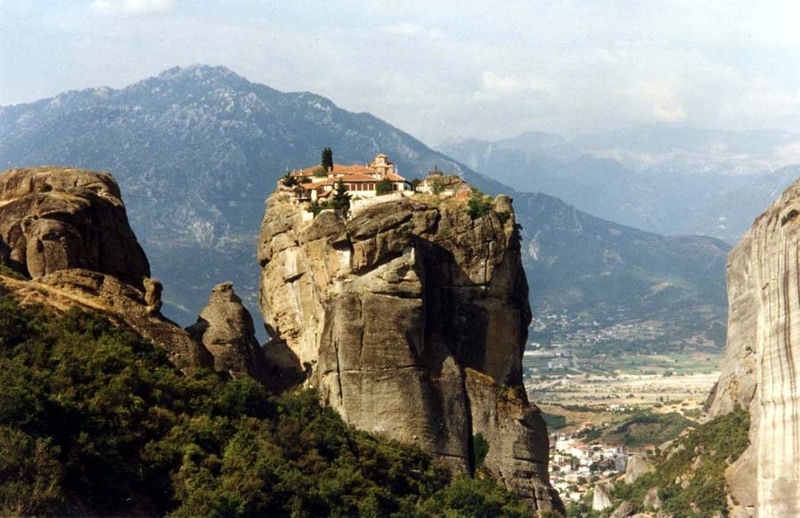 Monasteries of Greece by Chris Hellier is a lavish "coffee table" book with a chapter on Meteora. It features beautiful photographs with an interesting text. It also has a wonderful chapter on Mt. Athos, the preeminent monastic community that is closed to women and allows only restricted visitation by non-Orthodox men.